Ali Marrero Calderon was one of the first women to ride with Dykes on Bikes in 1976. She later worked with the People of Color Coalition against the Briggs Initiative and Prop 6. Acey Award honoree Ali Marrero Calderon was born in Puerto Rico in 1948. She arrived in California in 1964 but went back to Puerto Rico in 1967. 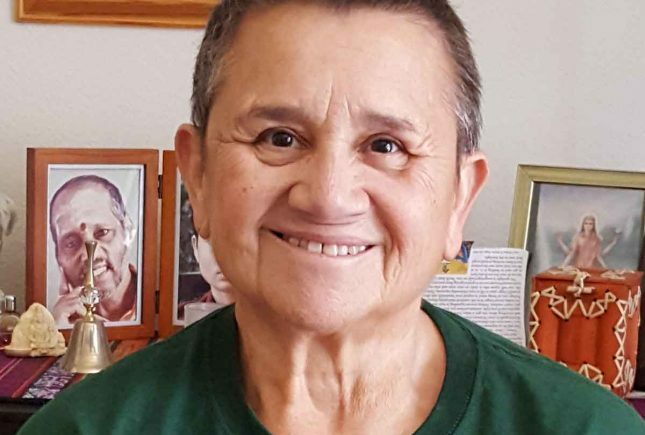 After high school, when she returned to California in 1969, she got involved with what was back then called the ‘Gay Revolution.’ In 1974, she had the privilege and honor to be a member of GENTE, one of the first lesbian of color organizations in this country. In the mid-eighties, she worked at SHANTI Project helping people living with HIV/AIDS and training volunteers to help people who were living with AIDS. She is currently working with the National Committee of Old Lesbians Organizing for Change. This year in Tampa, Florida there will be a gathering of old lesbians, and she’s helping organize a day-long intensive for lesbians of color. She invites lesbians of color who are in their 60s to come to Tampa and bring their input. The goal is one day to have a huge lesbian of color gathering where we can hear our music speak, our words, do our drumming, and dance our dances again. Go to OLOC.org for more information and to register for the Gathering or the OLOC Intensive. Talk a little about about your work in the early days, particularly lesbian feminist organizing. What did you do in the San Francisco Pride days? How has the work changed over the years and taken you to where you are now with OLOC? I never called myself a lesbian before 1969. In Puerto Rico it was just a marimacha, which is a dyke. What have been some of the big changes since then? The acceptance of lesbian women, voicing their opinions in rooms and making change a possibility. We effected major change. In the mid ’70s, we were being harassed. I was picked up by police departments just for sitting at a bus stop and waiting, and then, because I had men’s underwear. We were sent into the tank and we were beat because you were wearing clothes that were not for yourself. You know how that changed? I worked with the Police Department at one point in the mid ’70s, training cadets to have sensitivity around Latinos and the Latino community, and gays and lesbians, and how not to beat them up, and how not to do those raids, how to understand the culture. That was such an important thing. I also worked with mostly gay men in something called Butterflies and Oranges. Every weekend, we would get together. I had my motorcycle. I was one of the first Dykes on Bikes. Our group of lesbians provided security at gay events. When we did a march, it wasn’t the police who did the motorcycle patrolling––it was Dykes on Bikes. It gave us a sense of purpose. This is what we do. This is who we are. See us and hear us. These young men would come from all over the Bay Area and throw beer bottles and cans and beat up on gays in the Castro, which is a gay male district here in San Francisco. When we’d see a car throw something, we’d go, write down the license plate, and then we’d have this guy at the district attorney’s office send letters from the DA’s office to the registered owner. The DA was blaming Latino youth coming from the Mission into the Castro. They were really rich kids from Marim and the peninsula, taking their daddy’s cars, coming into the city. They thought they could get away with this. And they didn’t; it stopped. The work we were able to do at San Francisco Women’s Building landmark was just amazing. Everything was rented to women’s groups. We did events so that the building could stay open. I was an employee there at Community United Against Violence, which is what came out of all those weekends of Butterflies and Oranges, of doing the work that we did. Community United Against Violence was born out of that. I was also helping organize Pride–helping on the stages, speaking for lesbians and Latina rights off the main stage, helping set up the stages and do security for the parade. I left in ’72, and went back to Puerto Rico. When I came back, I joined a group called GENTE. GENTE was one of the first lesbian of color organizations. We were Filipina, Chinese, Puerto Rican, Mexican, Chicana, African-American, Native-American. We were the rainbow. To me, that was one of the biggest catapults for doing my work today. To organize something as big as a lesbian of color caucus for old lesbians, that’s my dream right now. That’s what you’d like to organize in the future? Yeah. That’s what I’m trying to do now even in OLOC, because we have a gathering every two years. We’re all aging. We’re all gonna get here, and so we need organizations that have a strong platform where lesbians of color who are aging as well can be heard, can use resources and can figure out how we can celebrate ourselves. We need to continue celebration, and to me that’s important, the celebration. The loss of Michigan Womyn’s Music Festival, where I worked for 15 years, was such a big loss for lesbians in this country. It’s like, as lesbian businesses close, where do we go? You’ve been described as a lesbian elder in many ways and obviously it’s because of your vision for a lesbian space and lesbian identity, and specifically for lesbians of color. What is being a lesbian elder, or being seen as a lesbian elder mean to you? As an older lesbian of color, particularly, what would your vision be for new kinds of organizing now, feminist lesbian organizing? Oh, what a vision. Because I’m a lesbian of color, I can only speak to what’s real for me and for a lot of us: to continue to speak out and to continue to do the work. OLOC is a fairly white organization. Right now I’m the only lesbian of color on the steering committee. I would like to bring on four more lesbians of color into leadership roles. I wanna be heard by all of my constituents. And I’m not talking just lesbians. I’m talking the young queer women, the women who don’t identify as lesbian. What would be your message to them? What would you want to tell them? What are some of the key challenges you find in your communities? Living is a big challenge today for a lot of old lesbians of color. I think that two of the biggest challenges are housing and health. Those two things are so major as we age. Not all of us have kids. Not all of us have parents still living. Not all of us are married and have partners. Not all of us have a community, but I would love to see a community of lesbians housed. What does it mean for you to be honored or to be aligned with Astraea as an Acey Social Justice Feminist Award nominee? It’s important because Astraea’s always been lesbian to me. I’m honored because the work that Astraea has done and helped, how many organizations that you all have helped to continue, and the way you’ve enabled us to continue organizing, to continue with the work that we all have to do. Very few organizations like Astraea exist and honor and recognize lesbians.